AtGames is a company I knew almost nothing about prior to this past week. I had seen their handheld consoles in stores like K-Mart before and they came across as cheap looking to me. This Christmas, however, I received an AtGames Arcade Gamer Portable containing 30 Game Gear favourites. Immediately, I was interested. However, also immediately I noticed a couple of issues. The first being that the handheld felt very flimsy in my hands. 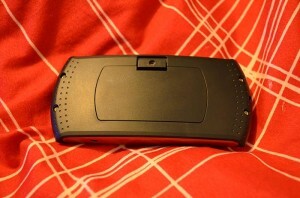 Additionally, the battery compartment is held in place with both a clip and a screw. I was a bit bewildered by the addition of a superfluous screw when the compartment also had a very firm clip, but whatever, it took seconds to remove the screw. First impressions of weird ancillary screws aside, upon actually turning the handheld on, I was pleasantly surprised. The Arcade Gamer Portable’s screen is one of its strong points, boasting a 2.4 inch LCD screen with rich, saturated colors and no ghosting. You’re greeted with the AtGames logo upon flipping the power switch on the top of the unit, then it’s on to the menu. The menu is easy to navigate, and it allows you to flip between screens by pressing left and right on the D-pad, which is a nice change from having to scroll through everything on other devices. When you find a game you like, you hit the start button, and it’s on to the game. The user interface is clean and intuitive, and I really appreciated the ease of navigation. By now, you’re also getting a feel for the D-pad. It’s very comfortable pushing it towards the up and down positions; however left and right isn’t so good. It can tend to be a tad unresponsive when you’re pushing left or right, and due to its weird, concave design, your thumb can slip off. The action buttons, however, are not an issue. They are generally very responsive and do not tend to stick while you’re playing. The screen on this little piece of magic is incredible. It’s a really high quality affair with rich, saturated colours that pop and no ghosting at all. It’s easy on the eyes, big enough for the games it is designed to play (bearing in mind that the Game Gear didn’t have the biggest screen in the world) and has good contrast. It’s just a shame you can’t adjust things to make them perfect for your eyes in particular. For some reason the Arcade Gamer Portable’s battery cover sports a snap-in clip and a screw for added security, we suppose. 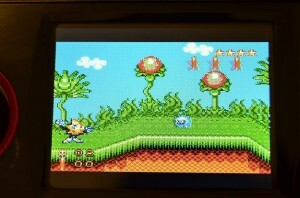 Every Sonic game released for the Game Gear, bar Labyrinth, is available on the handheld as well as Master System favourites such as Alex Kid In Miracle Word, Assault City, Aztec Adventure, Quartet, Kung Fu Kid and Columns. Each game is emulated pretty much perfectly with no bugs, slow down or flicker evident while playing. I had no real issues with any games I played, and if you want to play on your TV, you can also grab some composite cables and play on your favourite monitor. Video out is never a bad thing, ladies and gentlemen – embrace it. The selection of games is really quite great, and while there are tons of titles missing that I would have loved to see on here (notably Master of Darkness, Golden Axe Warrior and Altered Beast), what we did get is a very satisfying mix of genres and quality that should appeal to anyone who wants something quick to breeze through on that train ride to work. That is really all there is to the AtGames “Portable Video Game Player.” It’s a simple handheld that is very light, has decent enough control and some excellent features, like video out and crisp sound through headphones. Issues with a spongy D-pad and lack of control over the screen mean little when you have an excellent library of games in a tiny form factor that are perfect for trips on the train or in the car. Originally, I knew little about AtGames, however, now I am interested in seeing what else they have released considering the high quality of this release.